The Cane Thumper features the same great profile and body shape of the other Rojas signature shapes. It has a detailed head with large ribs on the bottom and hook pockets on the top, bottom and sides. These hook pockets give the Cane Thumper less plastic in the core of the bait to "ball up" on your hook point and interfere with hook sets. The tail features a paddle style which gives the Cane Thumper a nice swimming action. It can be Texas rigged with or without a weighted hook. It also is great on vibrating jigs or as a swim jig trailer. 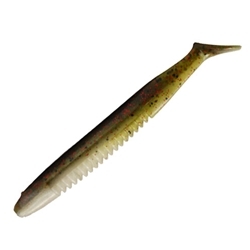 The Cane Thumper is available in many colors that will match any water condition or situation. It is great for swimming over vegetation, heavy cover or open water.